Calvary Custom Pools is a family owned and operated swimming pool construction and renovation company serving the greater Dallas and FortWorth areas. The owner and lead designer Jon Waltz is a second generation pool builder with over 20 years experience. Jon's approach to pool construction is very hands on. Not only will you work with Jon through the design process, you will also be guided every step of the way, from first consultation to pool chemical start up. We look forward to meeting you, and seeing your project through the fun of designing it, to the reward of using it. Pool Country Design has over 45 years of complete hand-on service using minimal subcontractors. We have three pool concepts to meet any budget level with our competitive pricing. So call us today! 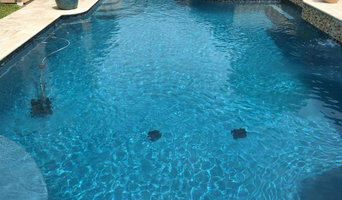 Vinyl Liner King specializes in vinyl liner replacements for in-ground swimming pools, and customizes pool liners, using only the best made liners in the industry. 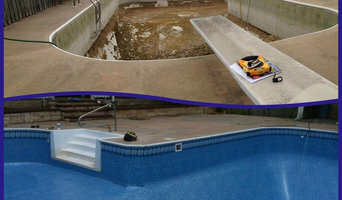 We do installations for Heldor, Tallman, Fox and other makes of pools. Call us at (972) 285-6817 for a competitive pool liner estimate. We are Ready to Renovate your In-Ground Vinyl Liner Pool today! Does your pool sometimes get dirty and unusable? Do you often find yourself dreading the weekly work that goes into keeping a pool safe in addition to standard pool maintenance? Are you in need of a pool service company in Lewisville that handles both swimming pool cleaning and pool water maintenance among other issues? Well, look no further for your swimming pool cleaning company! Pool Logic LLC, established in 1999, is your go to pool cleaning company serving Lewisville and Flower Mound, TX and the metro Dallas area. We'll take care of all your pool cleaning and pool maintenance needs in one trip. Pool Logic offers pool repair services as well as regular pool cleaning membership packages. Pool Logic takes pride in providing the fastest, most reliable pool cleaning and pool maintenance services in and around Lewisville and Flower Mound, TX. Swim Solutions Pools, Inc is a pool service / pool company serving the Dallas, TX area. Services include Pool Cleaning, Pool Maintenance, Pool Acid Washing, Pool Equipment Repair, Commercial Pool Service and Pool Remodeling. Sapphire Pools and Spas helps you find the right solutions to meet all your pool service needs. We are a Certified Pool Operator by the National Swimming Pool Foundation. Our technicians are trained to maintain proper water chemistry so that your pool stays sparkling clean and comfortable. Regular pool service with proper chemical balancing allows you to enjoy your pool they way you want too. It also reduces the chances of major problems down the road by catching minor problems and fixing them before they lead to major repairs. Lone Star Custom Pools, Inc.
Lone Star Custom Pools, Inc. is a Custom Swimming Pool Contractor & Spa Builder for the Dallas, Fort Worth and North Texas area. We pride ourselves in the fact that the majority of our business comes from the referrals of existing clients. Contact us to learn more about our unique approach to Custom Swimming Pool and Spa Design, as well as our commitment to structural integrity, and our attentive client services. Certified Pools is a family owned and operated business. With over 28 years of experience you are speaking to the pool repair experts when you call our company. We stand by the quality of our work. We are faith based company that operates our company with quality and integrity. We take pride in every pool remodel and repair that we do. Owner, Jeff Moore does not aspire to own the biggest pool company or build the most expensive pools. He does, however, aspire to own the best company building the best pools. Work crews and equipment are devoted to one project at a time. This laser focus on each job means that nothing is overlooked. Clarity Pools designs each pool and surrounding environment specifically for the customer and job site. We carefully engineer the layout and drainage issues for the site and soil conditions. We use the most technologically advanced equipment and the most modern techniques available. Although Texas does not regulate pool builders, Clarity Pools has chosen to belong to The Texas Residential Construction Commission and The Association of Pool & Spa Professionals. All our methods and standards meet or exceed those set by these two groups, so we can provide clients with the guarantee that the pool is done right the first time. Over the long term, clients enjoy their pool environments much more and pay less in repairs. Clarity Pools has an A+ rating with The Dallas Better Business Bureau and also belongs to Service Magic. Both of these consumer groups add a layer of confidence that Clarity Pools will deliver top-notch workmanship, professional ethics, service and client satisfaction. Clarity Pools is very proud of its fine reputation. “A Better Pool Service” was born as a result of the consumer frustrations experienced by our founder. After working with no less than five different service companies to maintain the pool at his residence, our owner finally concluded that high-quality, trustworthy pool service wasn’t available in the greater Dallas area. That’s when our founder decided to take matters into his own hands. He hired people he could trust, sent them to the National Swimming Pool Foundation (NSPF) for Certified Pool Operator training (CPO). When his team was built, he founded “A Better Pool Service.” Since then, he has continued to seek and hire the best talent, and invest money in their advanced training so that they can provide the best pool services possible. Advanced training, however, is not enough. Every employee of A Better Pool Service must sign a “Code of Ethics and Work Performance Agreement.” This demonstrates the employees’ commitment to superior service, and helps to ensure that this company will always be A Better Pool Service. A Better Pool Service is an accredited member of the Dallas area Better Business Bureau (BBB), and also a member of the Association of Pool and Spa Professionals (APSP).